...do the Offensive Lineman assign junior members of the team a writing assignment about the history of the Stanford vs. CAL rivalry. 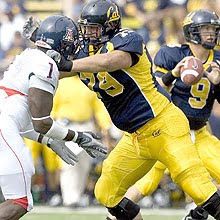 Research project: Tepper wants to make sure Cal's young players understand the history and tradition of the Big Game. So he "assigned" freshman center Mark Brazinski to write a six- to eight-page paper on the history of the Stanford Axe, due Tuesday. "We send him on periodic research assignments," Tepper said. "I told him no Wikipedia quotations, either - we need good, reasonable sources."